Up to 12 hours of overnight protection! With Pampers Baby Dry diapers, your baby can get up to 12 hours of overnight protection, which helps him get the uninterrupted sleep he needs for a great morning. Plus, Baby Dry has 3 layers of absorbency versus only 2 in an ordinary diaper. And with a wide UltraAbsorb layer, Baby Dry offers outstanding leakage protection and flexes for a snug, comfortable fit. These are the only diapers that work for my daughter! Love being able to order delivery diapers and not haul a huge box home in the stroller. love ordering these for my baby! now I don't have to find someone to drive me 3 and half hours away just to buy big box of pampers.. now I can just order the same price as the store I get them! and shipping is fee.. yay! The only diapers that work for my daughter. These are great as they are absorbent and don't leave red marks around baby's chubby thighs. Also, delivery is super convenient! This is the best for overnight. And how quickly well delivers to your door is the best for busy moms with even busier babies. Super convenient! These diapers work really well overnight & do not leak. I have a 17lb baby & use Baby Dry size 3. The one complaint I have is that they are much too heavily scented! After trying other brands that constantly leaked, I only use Pampers now. I think this is the best diaper ever! Thin and light, not bunchy, holds so much overnight! Awesome diapers for overnight protection. Love the long lasting dry of these diapers best I have found. They fit my boys great both my 3 year old and almost 2 year old wear them. Pampers for both my boys and they hold a lot so the kids can sleep through the night! Enjoying the rewards points too! Pampers work for us - they absorb well through the night and we rarely have leaks or spills! This is the best disposable diaper hands down. These are the only diapers we've tried that my son rarely pees through. If you have a heavy wetter, these are definitely the best option. Great! They seem to seal pretty well around the bum. They are scented, which I'm not a fan of. I slept next to my diaper change table in my room with the cupboard door open, and the scent of them wafted out and by the time I woke up a few hours later, my throat was killing me! But they don't seem to be irritating her bum. They are also kind of loose around the top. Also, although they seem well fitting in the legs and bum, they leaked today after 4 hours without a diaper change(we were out), even though they are supposed to be good for overnight. Otherwise though, they seem to be doing a good job! Our family swears by Pampers Diapers! Other diapers just don't seem to keep my little man dry and happy, Thankfully the Baby Dry are gentle enough for his sensitive skin! Easy to use, works well and seems comfortable. We had to temporarily buy another brand as we had ran out of pampers and my husband and I both prefer the pampers brand. We just love the overall performance of Pampers, we wouldn't swap to another diaper for anything! When our daughter grew into the Size 2 we swapped to Baby Dry and loved how the keep her dry over night and all day. We've tried Cruisers but the fit of Baby Dry is just much better. We love them and getting them through Well.ca is the fastest and cheapest method. Keeps the bad stuff IN. I used Pampers with my son and loved them. I now use them with my daughter and still love them! Love the product! The Baby Dry truly keeps the baby dry. We've also tried the swaddlers which I like for their line that shows when the baby has wet their diaper but I value the absorbency much more and seems to fit my daughter way better (e.g. she never leaks). There are the occasional number 2 leaks but that might have to do with us not having secured the tabs tight enough. I made the decision to finally switch from Swaddlers to Baby Dry and I've been very pleased with these diapers the whole way through. 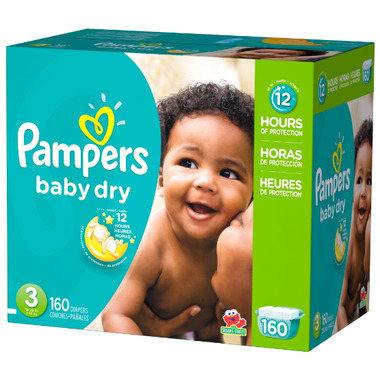 Pampers recently added some additional layers of absorbency to the Baby Dry collection and this made a big difference in keeping my baby dry through the night. We have never had any problems with leakage throughout the day and now, with the extra absorbency, the same is to be said for nighttime. Pampers are excellent, especially when they are on sale! We normally use Huggies Snug n Dry, but when these were on sale we decided to give Pampers a try since they were such a great price! They worked just as well as our normal brand. Usually any brand works for our toddler in size 5, but for our 2 month old in size 2 not all brands work well and hold in watery breastfed poops. These did great and no blow-outs or mess! We actually just went our first whole night without a nighttime change and the diaper held up great, no leakage!